A student in the Counseling Psychology Program on the Chicago Campus, Aleksander also works as a trans and gender non-conforming (GNC) outreach leader at Howard Brown Health, the Midwest’s largest lesbian, gay and bisexual health organization. Howard Brown boasts a health and social service delivery system that focuses on seven programmatic issues, including primary medical care, behavioral health, research, HIV/STI prevention, youth services, elder services, and community initiatives. In his position, Aleksander provides support for trans and GNC individuals “who may be struggling with and/or facing hardship in many different ways,” working within the aforementioned communities to involve people in healthcare, both medical and behavioral. 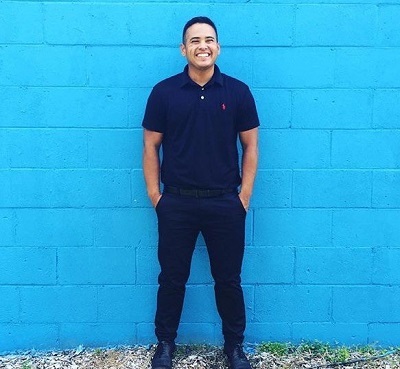 The position at Howard Brown, along with research he is conducting on Latinx trans men with the Immigration, Critical Race and Cultural Equity Lab (IC-RACE), a research lab founded by Counseling Psychology professors Dr. Hector Adames and Dr. Nayeli Chavez, has enabled Aleksander to learn much about the communities he serves and to grow both personally and professionally. He has had the opportunity to work on the IC-RACE project, called the Translatinx Project with both Drs. Adames and Chavez and 2012 Counseling alum, Silvia P. Salas-Pizaña. Members of the team will be presenting some of their research later this month at Columbia University’s 34th Annual Winter Roundtable on Cultural Psychology and Education, in a presentation titled Between Authenticity and Hate: Latinx Transmen Surviving Community Violence. Aleksander is a student studying in the Latino Mental Health Concentration, and expects to graduate in 2018, after which, he plans to pursue a doctoral degree in psychology and continue to work in trans health. He seems a perfect fit for the role he’s chosen. Describing Aleks’ work as “consistently exemplary,” Motherwell shared that because of Aleksander, their outreach team has been able to connect with community members in a way that has been more structured and purposeful than it would be if Aleksander weren’t a part of it.